(KYODO NEWS - Oct 22, 2018) Japan Sports Agency chief Daichi Suzuki suggested Monday he hopes establishing a Japanese version of the United States' National Collegiate Athletic Association can help eradicate violence in collegiate sports, an issue which has rocked the country in recent months. The agency and other organizations have been preparing to create a "Japanese NCAA" by next spring as an organization that promotes and sets standards for college sports and encourages schools to take responsibility for their sport clubs and teams. "I want schools to consider sport clubs as a part of their overall program, and through that improve their governance and ensure their compliance (with laws and regulations)," Suzuki said following a preparatory committee meeting in Tokyo. 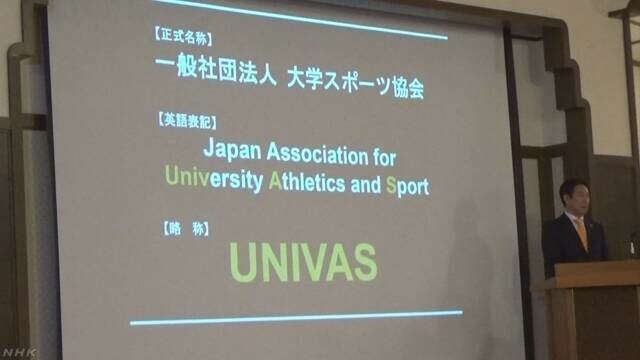 The preparatory committee, which included representatives from the government, schools and private sector, announced Monday that the organization will be called the Japan Association for University Athletics and Sports (UNIVAS). The sports agency has said it would seek membership from about 200 schools, 20 organizations including student athletic federations, and 100,000 student-athletes when UNIVAS kicks off. The new body would also seek to brand college sports to create higher revenue streams. The agency aims to bring in revenue of around 2 billion yen ($17 million) in its first fiscal year. UNIVAS is also expected to hold seminars for coaches to improve their qualifications, and help students balance academics with sports. A string of scandals involving college sports have made headlines in Japan in recent months. In May, two former coaches of a university American football team in Tokyo received lifetime bans from competition for ordering rough play, an instruction that led to one of their players injuring an opposing player with a dangerous tackle. The agency devised the plan to create a version of the NCAA since Japan does not have a single organization that oversees college sports, although there are governing bodies for high school and junior high school sports. While the NCAA has annual revenues of about 100 billion yen due to money from the sale of broadcasting rights, Japanese collegiate athletics programs have limited funding and often rely on students themselves to make ends meet. The possibility of Japanese college sports being a successful business has attracted attention ahead of the 2020 Tokyo Games.